Yesterday i was browsing Toys'r'us, with a 28mm and a 15mm miniature in my hand, looking for something fitting the scale. 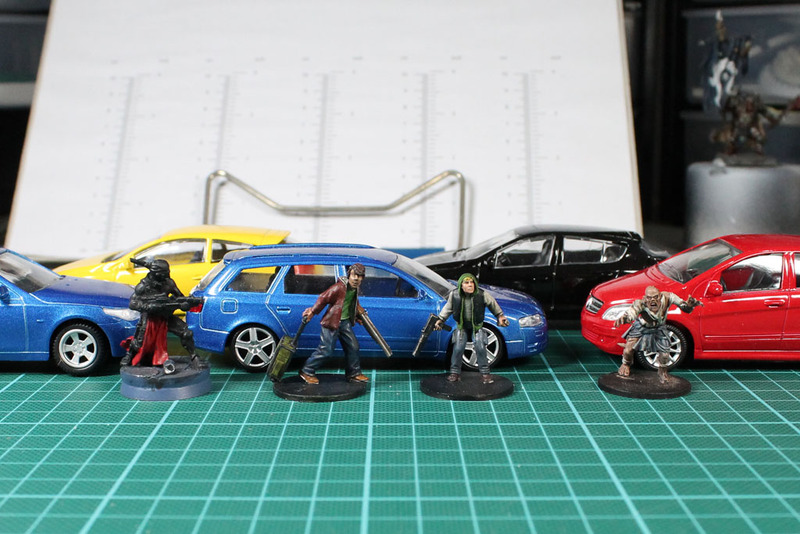 Every now and then they have some usable models for small money, that a great as a gaming figurine or terrain accessoire. Unfortunately in 1:100, let's say 15mm, there was nothing for me. But they had some bargains on 1:43 die cast kits and FastLane (private brand of toys'r'us) covers several scales from 1:12 up to roughly 1:87, but also some in 1:43, but you need to see it for your self to be sure. The MondoMotors and Burago vehicles were down to 3 euro a piece, which is an incredible deal, as the die cast kits usually cost around 6-7 euro up (but in general even more, 11-13 euro) per car. 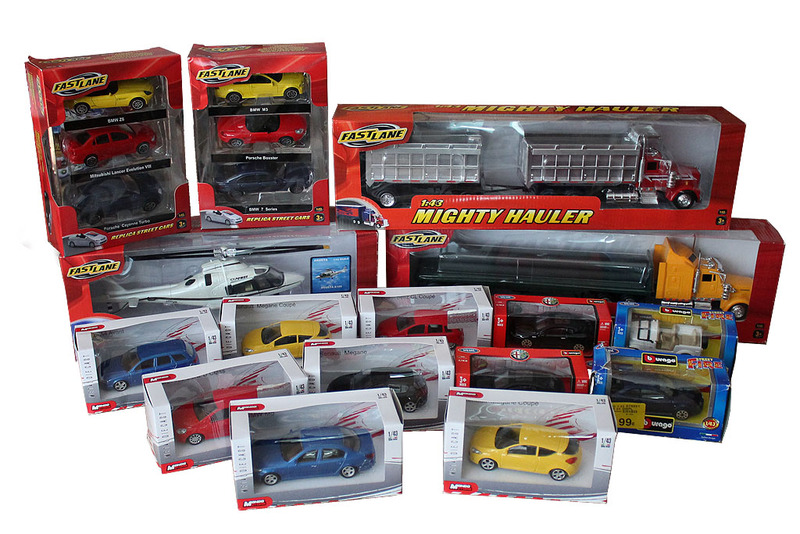 FastLane is even cheaper, a set of 3 for only 7,99 Euro, the helicopter 12,99 euro and the trucks 10 euro each. What's the deal beside the low price? First of all, they are civilian vehicles, which is rather rare. There are plenty of suppliers who offer super cars or police and construction vehicles. But the zombie apolypse or city fights aren't usual in the posh area. And on the other hand, the vehicles provide a realistic touch to a game, the obscure the line of sight but still keep it playable. 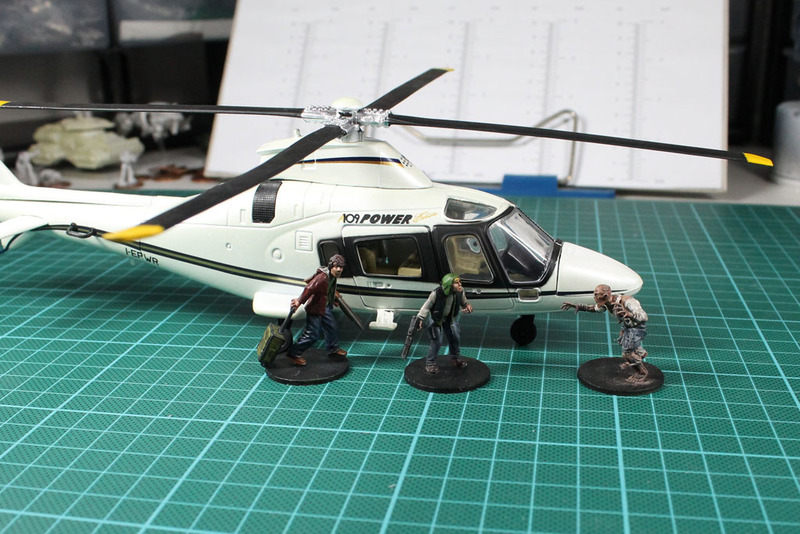 1:43 isn't the right scale, as it is a hint to large, but works great with the heroic scale of most 30-32mm models, as you can see by the Infinity, Hasslefree, Reaper and Mantic figures. 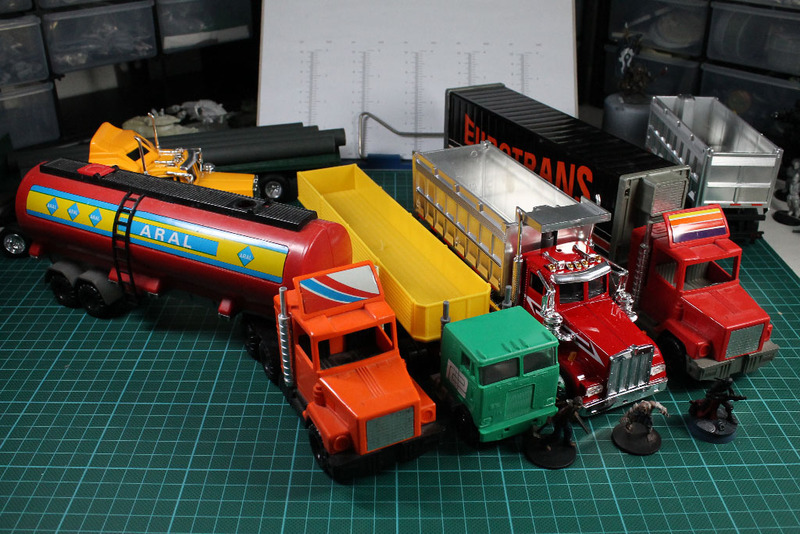 The truck is cornered by some flea market buying for 2-3 euros each, with the matching scale. Manufacturor is unknown, but the 1st and 4th truck carry a Made in GDR (East Germany). The helicopter? Seriously? You are questioning the heli? Beside "get to the chopper!" its a must have escape vehicle for any zombie apocalypse. Some of you might say, ah, wrong timeline, what do i need that for? 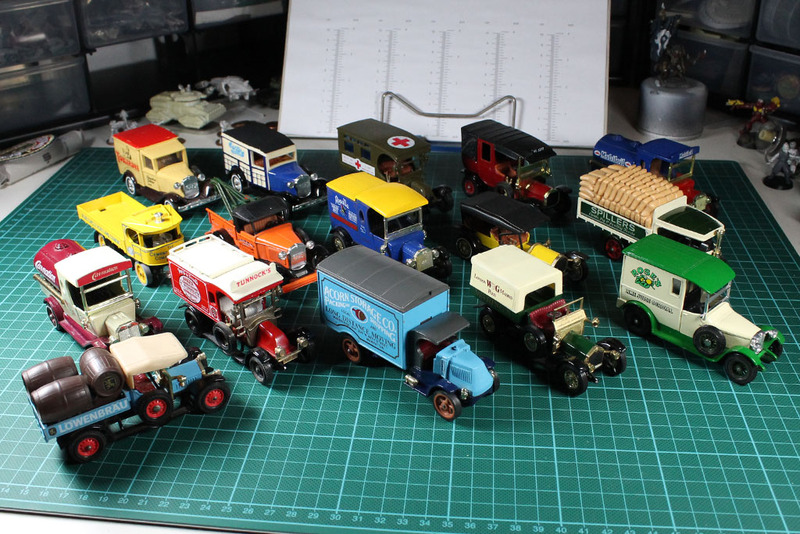 Well, for you guys there is the Matchbox Models of Yesteryear. I can't believe, i didn't show these earlier, as i own those kits for around 1,5 years now. 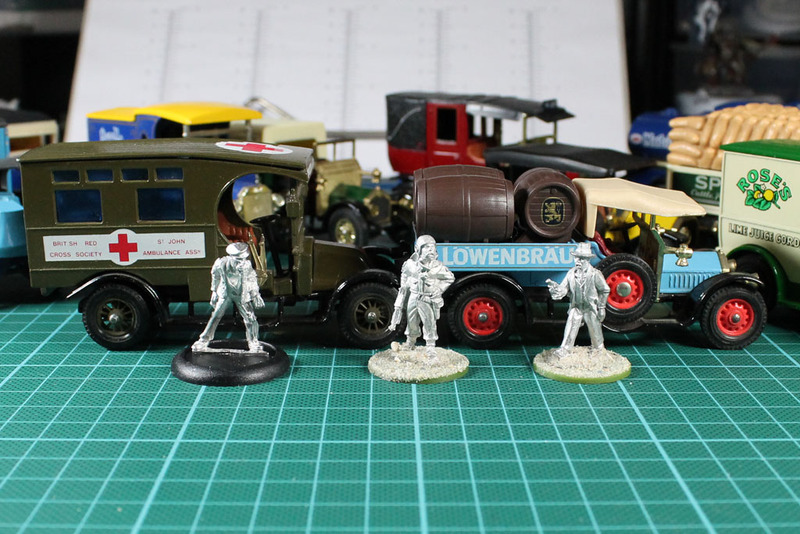 They are a special editions / limited runs in a larger scale by Matchbox, around 1:43, which can be seen by the comparison with Westwind, Bolt Action and Artizan. These aren't that cheap (most go around 8 euro upwards, and some rare vehicles even 40 euro and more), but i was lucky enough shooting a lot at eBay for together 50 euros. The yesteryear kits will most likely stay that way, but the modern cars get a new paint job, that matches the battlefield. es gibt noch viel mehr.verlier ruhig den repekt vor den dingern.nimm sie auseinander und bau dir was feines. Ich habe ebenfalls 1:43 Modell in Massen bei ebay erstanden. Aktuell habe ich knapp die Hälfte geschrottet und verrostet. ich bi gespannt was du noch so alles vor hast.